Astronomers with the Remanzacco Observatory in Italy captured this view of the small asteroid 2012 KT42 as it zipped close by Earth on May 29, 2012. Last month's flyby of Earth by asteroid 2012 KT42 was the sixth-closest asteroid encounter on record. It whizzed by inside the orbital distance of Earth geosynchronous satellites. This near miss was tracked by the NASA Infrared Telescope Facility atop Mauna Kea in Hawaii, yielding valuable data about the speeding space rock. 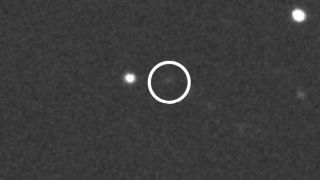 Asteroid KT42 was discovered by the Catalina Sky Survey project in Tucson, Ariz., which spotted the object a scant 23 hours before its closest approach on May 29. That allowed time to trigger a preplanned "Rapid Response Program" involving an international team of astronomers led by asteroid experts at the Massachusetts Institute of Technology in Cambridge, Mass. Binzel is a member of the NASA Planetary Defense Task Force. He is also creator of the Torino Scale — a cosmic equivalent to the Richter scale for earthquakes — a way to categorize the Earth impact hazard associated with newly discovered asteroids and comets. By using the NASA IRTF, near-infrared spectral color measurements obtained simultaneously with the facility spectrograph revealed details about KT42. The object's color signature indicates it has a carbon-rich composition, perhaps analogous to carbonaceous chondrite meteorites found on Earth, from which a moderately dark reflectivity (albedo) is inferred. "The data we are after are the spectral colors, which act like a fingerprint for determining what the object is," Binzel said. "Most importantly, from the spectral colors we can interpret what the object is likely made of and how reflective it is. That pins down the size and refines our ability to estimate whether any ground damage might occur." By knowing both the reflectivity and visible brightness of the object, the deduced size of asteroid KT42 is about 7 meters (23 feet) across, about the size of a duck boat. Had 2012 KT42 actually entered the Earth's atmosphere, its relatively small size and likely weak structure probably would have caused it to be destroyed before it had a chance to cause damage on the surface. Perhaps only a few fragments would have reached the ground as meteorites. "It's about both science and public safety," Binzel said. "Chances are that any impacting object will result in just a few fragments on the ground. Scientifically the match between telescopic data and laboratory specimens is a windfall that usually only spacecraft missions can achieve," he said. "The movie of KT42 comes about because we saved the images from our guide camera. They are a critical part of how we find and lock on to the target," Binzel explained. Binzel said that to lock on to these objects requires the telescope to track five to 10 times faster and at odd angles compared with the normal east to west motion of a star across the sky. "Very few telescopes in the world can do this. Kudos to this NASA telescope…it is specialized for this task," he said.